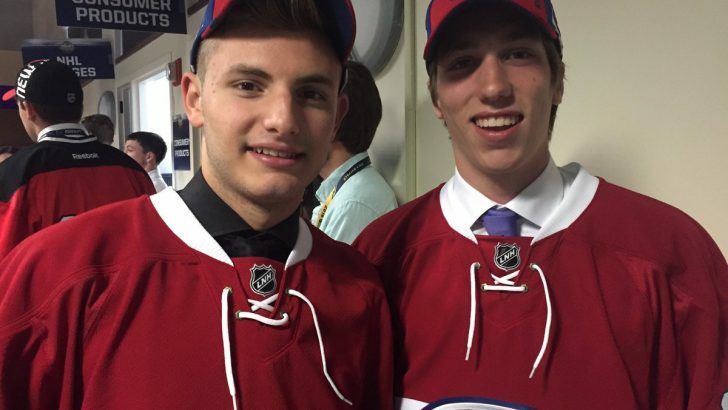 The Montreal Canadiens were in desperate need of a boost to their prospect pool going into the 2016 NHL Entry Draft. Holding a top-10 pick and not a lot else, the Habs needed to hit a home run and many believe they did just that when they selected Mikhail Sergachev ninth overall. He instantly became the Canadiens’ best prospect and has spent the first few days of development camp showing off the skills that had many scouts calling him the best defender in the draft. In my estimation, Marc Bergevin and his front office did an incredible job at this year’s draft. As a fan, I follow the OHL very closely. Will Bitten and Victor Mete – the Habs’ second and third picks – are players that I had very high on my draft lists all season. Both are tremendous talents and fell well below where they should have been selected, likely due to their less than ‘ideal’ size. The big draft adds respectability to a prospect pool that was almost embarrassing. The Canadiens’ have a couple blue-chip youngsters in the NHL – Galchenyuk and Beaulieu – but beyond that, the cupboards were pretty bare. Here is how the prospect depth chart looks for the Canadiens after a very solid 2016 draft. This group of forwards leaves a lot to be desired. Charles Hudon and Nikita Scherbak look as though they can have a decent impact in the NHL and as stated above, I truly feel the Habs lucked upon something special when Bitten fell to them at 70th overall. Beyond those three, there are a few guys – De La Rosa, Bradley and Matteau – that look like they can have decent journeymen bottom-6 careers in the NHL. Michael McCarron is a guy that has high hopes. A first round pick, McCarron made his NHL debut this past season and seemed to impress a lot of onlookers. I spent a lot of time watching McCarron on his Memorial Cup run in Oshawa – as a Generals season ticket holder. I don’t want to sound too pessimistic but unless he develops a lot more, I don’t see him as anything more than a complimentary bottom-6 forward in the NHL. I could be wrong – I hope I’m wrong – but McCarron will have to develop a lot to live up to the 1st round label that goes along with his name. With Sergachev and Juulsen, the Canadiens have a pair of defenders that look to make a big impact in the NHL for a long time. Sergachev has the type of talent that can anchor a top pairing for a decade, he just needs to learn how to utilize it with consistency in an NHL system. Victor Mete is a bit of an x-factor in this group. He is a tremendous skater and played a bigger role for the 2016 Memorial Cup Champion London Knight this season than 5th overall pick Olli Juolevi. Mete is small for a defender and will have to gain a lot of strength in order to play the position at the NHL level. He’s smart and has great instincts with the puck so if he is able to learn to play against much bigger opponents, he could be a very good weapon on the blueline in Montreal down the road. As long as Carey Price is healthy, the goaltending prospects for the Canadiens are a little irrelevant for the time being – aside from any sort of trade value. The Habs spent a high pick on Zach Fucale a couple years ago, and while his performance since being drafted hasn’t exactly been stellar, he’s got a lot of time to develop. Michael McNiven was signed as an undrafted free agent last September and will spend at least another season playing for Owen Sound in the OHL. The team also signed NCAA free agent Charlie Lindgren last March who will likely split time with Fucale in St. John’s this season. For the foreseeable future, the two will likely battle to be the permanent ’emergency starter’ down the road if Carey Price ever has another season like he did this past year.